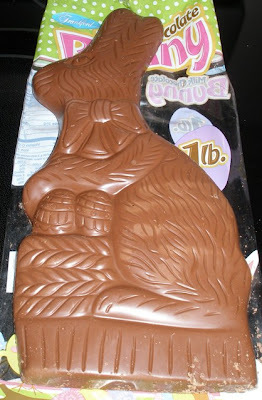 Anyway, that 1-lb chocolate bunny is one of the treats that the little one got from the easter bunny. I've been staring at it for days thinking if I should even open it or not. But then, it's not mine so that's not my decision, is it? Since the other treats are now history, the little one decided to start munching on this one a few minutes ago. I only gave her a little portion since I cannot imagine her finishing the whole thing in one sitting. As for me, I'm trying very hard not to eat it but it's proving to be a struggle...tee hee. I'd probably give in a little bit later...then I'd hit the treadmill again to burn some of it off. Ha! The joys of eating, eh? wow! that is one huge bunny. that won't last long though if that was in our house hehe. hope you're enjoying your early summer temps. it's still kind of cold here in our area largely due to our proximity sa beach.